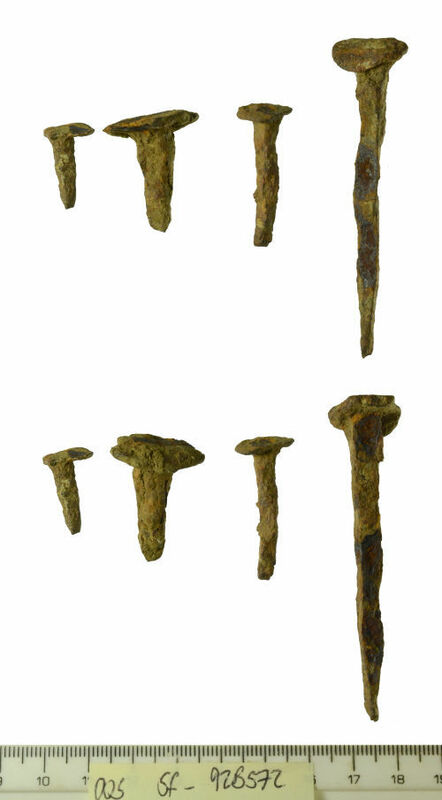 An assemblage of 4 iron nails of Roman to Post-Medieval date. They have a combined total weight of 24.48g. 1) It has a flat circular head. On the back face is an integrally cast stem. This is rectangular in section and tapers to a point. This nail measures 10.81mm in diameter, 18.83mm in length, 4.73mm in thickness, 2.21g in weight. 2) It has a flat circular head. On the back face is an integrally cast stem. This is rectangular in section and tapers to a point. This nail measures 22.94mm in diameter, 27.56mm in length, 6.67mm in thickness, 8.15g in weight. 3) It has a flat circular head. On the back face is an integrally cast stem. This is rectangular in section and tapers to a point. This nail measures 13.37mm in diameter, 31.85mm in length, 4.27mm in thickness, 3.22g in weight. 4) It has a flat circular head. On the back face is an integrally cast stem. This is rectangular in section and tapers to a point. This nail measures 17.06mm in diameter, 72.17mm in length, 7.32mm in thickness, 10.90g in weight. These nails are similar to Mannings type 1B (Manning, 1985, p. 136, no. R90-92).